I recently spent some time driving on an airport runway. No, I didn’t do this because I’m an old person who ran through a barricade, which is how a Cadillac usually ends up on a runway. Instead, this took place at a highly organized event, with cones, and timing devices, and those little triangular flags on rope they always seem to have at automotive gatherings. Before we get into the details, a little background. Last September, I learned that a private airstrip in rural Georgia would be shut down for a weekend of drag racing. This was courtesy of a company called “wannaGOFAST,” which sounds like the kind of business name you create when you’re drunk, and you’re with your friends, and someone comes up with the idea of shutting down a runway for a weekend of drag racing. Naturally, I signed up to participate in my E63 AMG wagon, which I thought was very fast, but I quickly discovered was actually very slow. See, it turns out there are guys who really love this stuff, who devote their whole lives to runway racing, and they showed up in Nissan GT-Rs with roughly the same horsepower as one of those ships that’s too big to fit through the Panama Canal. So, for the first time in its life, my E63 AMG wagon was a disappointment for reasons other than its pewter exterior color. Because of that experience, I didn’t immediately sign up with the V Wagon when the event came back this year. 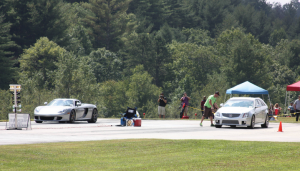 I didn’t want to drive all the way out to the boonies, sit in line for hours as the other cars raced, and then, when the time came, embarrass myself next to a GT-R that was about 80 horsepower shy of requesting clearance to take off. And I held tightly to that viewpoint until I realized, in a moment of clarity, that the whole event would be a great way to knock off a column or two. So I signed up, and this is a rough description of what happened. For starters, I use the word “rough” because I had to wake up at 4:30 a.m. to get there by the 7 a.m. start time. But I did it: I got up in the dark, pushed through the fatigue, drove two hours, arrived promptly at 7, as stated in the directions, and then did what you always do when you arrive promptly at the time stated in the directions, namely: sit around and wait. So I sat around and waited, which mainly involved eating muffins while sizing up the other cars. As I recall, they fell into two distinct categories: one, guys like me who were taking their daily drivers up here to have a little fun; and two, guys who believed that, given the right conditions and vehicle setup, they would, on this day, break the world land speed record. After about an hour of waiting combined with a short safety briefing (“Jane, did the insurance company want us to mention anything else?”) we started racing. Of course, what I really mean is the guys at the front of the pack started racing, while I drove my car forward, one space at a time, for the better part of the morning. 3. I look around to see what the hell happened to the NSX. I saw him again several days later, when he finally finished the run and came to pick up his time slip. Ha ha ha, of course I’m just kidding, NSX owners! No need to send me e-mails telling me you know where I live! After all, I have a Range Rover, and after the events of the last week, I’m very aware of its self-defense capabilities. 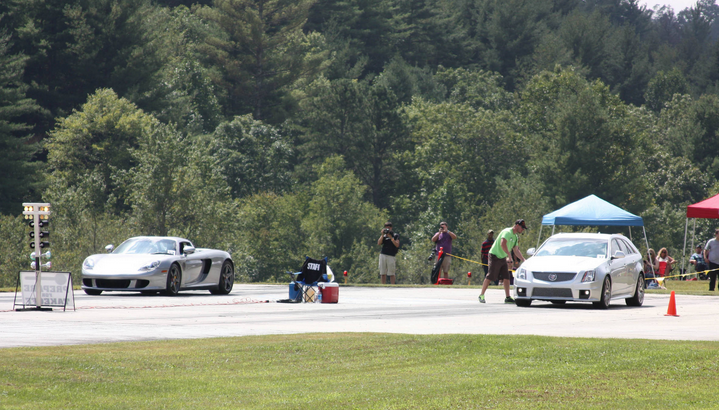 Plus, the NSX isn’t really that slow – just no match for the wagon. A second run, also against the NSX, resulted in about the same conclusion. But the third run was an entirely different story. That’s because it was against a Carrera GT. I should take a second here to stress that just because we were in rural Georgia doesn’t mean the cars were a bunch of hayseed pickups with lifted tires and rebel flags. No, sirree! That was the parking lot. In the actual event, we had those zillion-horsepower GT-Rs, and a few Lamborghinis with twelve turbochargers, and a couple of modded Corvettes with really wide tires; tires so wide that if you were standing behind them in line at Chipotle you might suggest they skip the extra chicken. But the Carrera GT still turned everyone’s head. And I lined up up next to it. Lining up next to a Carrera GT is kind of intimidating. That’s especially true in the V Wagon, because you think you’re pretty cool, and then you look over and remember you’re really just a guy in a used GM product with no sunroof. Imagine selling wooden kitchen utensils at an arts festival, and they’re really cool, and people are buying them, but the guy in the booth next to you is Rembrandt. As the race started, I pulled out to an early lead. I later found out the driver was easing into things so he could protect his five-figure clutch, but it really just gave me false confidence. 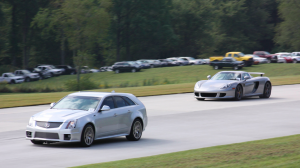 When I pulled out in front, and then won the quarter mile, all I could think was: HOLY CRAP! THE CADILLAC HAS IT! IT’S PULLING AWAY! AHHHH! I’M GOING TO WIN! Let’s just say the Carrera GT caught me, pulled alongside me, and passed me, all in a length of pavement roughly equal in size to a credit card receipt. And I’m not talking about one of those crazy foot-long receipts you get at Best Buy. I mean the kind you get when your toilet is overflowing and you drive to the store as fast as you can after realizing you don’t have a plunger. Seriously: In about a second, I went from sitting in the car thinking I might take the guy to sitting in the car and wondering why I couldn’t read his license plate anymore. The crazy thing is we weren’t going slowly at this point. He didn’t hunt me down until after the quarter-mile ended. By then, I was going well over 100 miles per hour – but he still passed me like we were coming out of the gate at Churchill Downs, and he was riding a thoroughbred, and I was riding a mobility scooter. When we collected our speed slips, the results showed a 20-mph difference. 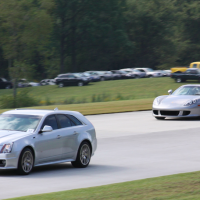 On our second go-around, I narrowed the gap slightly, bringing things to 134.67 mph for the Cadillac, and 153.20 mph for the Carrera GT. Still a huge split when you consider I had the edge halfway through the race. So the V Wagon is fast. And its 135 mph finish beat several cars at the runway. But it’s no thousand-horsepower Lambo or rocketship GT-R. And it’s definitely no Carrera GT. At least, until wannaGOFAST adds a “transporting a coffee table” challenge. Then I want a rematch. Here’s a video courtesy of Rican219 on YouTube. Turn down your speakers.